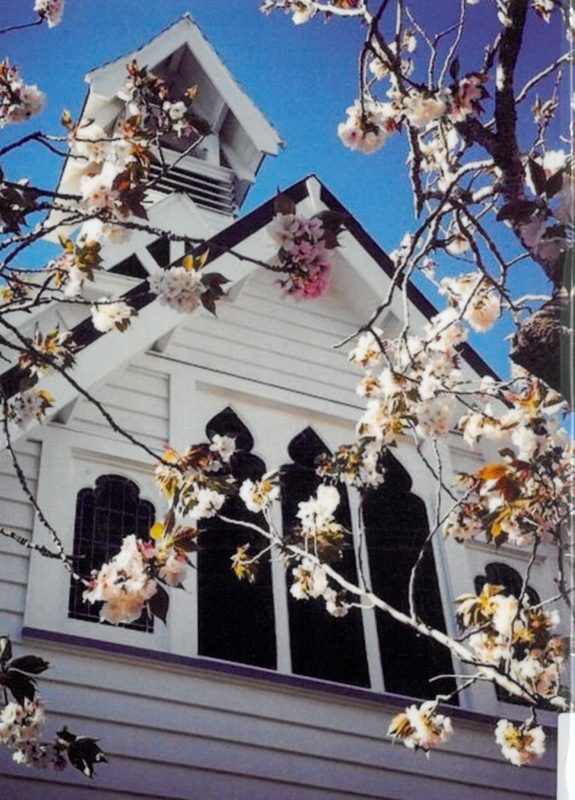 I recently heard someone refer to St George’s Anglican Church in Auckland, as being the 'wedding' church. I'd been to a funeral once there, a few years back, and thought it was a pretty amazing historic building with all the wood and the stained glass windows and the old fashioned pews. But I'd never thought of it as a wedding church, and in fact had never realised there was such a thing. Granted, the person who told me this was of an age where she had seen her children married in the kind of weddings that require a PhD in Organisation along with a serious talk with someone at the bank. Barefoot on a beach with a single daisy was never going to cut it with those girls. But for there to be such a thing as a wedding church? My ignorance on such matrimonial matters is clearly appalling. 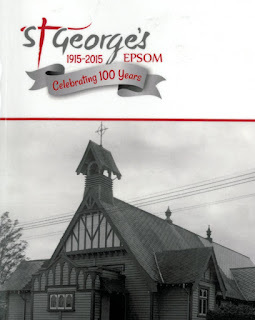 Thus it was quite a coincidence when I was checking out the new books here at the Central Research Centre this week, that I saw a copy of a book celebrating the centenary of St George’s Church in Epsom. Surely this was a sign that I should write about the wedding church. Plus we are still in June, and June is the month of weddings (Juno being the Roman goddess of marriage). I've no doubt the wedding churches of the world are overflowing with marital loveliness right now. Back to the book. Besides general information on the church and its history (although previous histories were written at the 50th and the 75th anniversaries) for the family historian, the gems lie in the accompanying disc. It lists office holders from 1914-2015 so if you wondered if your Anglican ancestors were on the parish council, then he or she will be named. It doesn’t provide much more information than names but its a good start or confirmation of information you might have. The other nice touch, though, is the PDF of the 1953 St George’s Messenger, a charming little publication that gives heaps of parish info for the year. The parish had benefited from the estate of the late Mr H. Butler to a hundred pounds, and Mrs Partridge was much appreciated for playing the organ and managing the Sunday School. A Coronation Dance was being planned in June to celebrate Her Majesty's coronation the month before, and a nice tribute was paid to Mr G. Chevis who had 'the remarkable record of over 50 years of continuous choir work, many of which have been spent at St. George's. His choir service has been an inspiration, as there have been few Sundays on which he has not been present twice a day. We offer him our heartfelt sympathy in his illness..." So there are lots of little gems like that within its pages about parishioners. What caught my eye as I flicked through, though, was the following comment on page seven, about purchasing the property next door. "In addition to the many present advantages, the parish now has adequate land for a rebuilding scheme, when the time comes in the far distant future for our wooden buildings to be replaced." The church as we know it was built in 1926. No doubt there are a good number of brides and grooms eternally grateful that the old wooden building wasn't knocked down and replaced. We have a selection of church histories of all denominations in the research centre, including the St George's Church Golden Jubilee book from 1965. There is so much information in these books, they're worth a browse for any gems you might find, if not for a look at an aspect of New Zealand culture in the early parts of the last century. You can do a search on our catalogue - just typing in the name of the church in the catalogue will do the trick.